This page on Roman Arches is a continuation of an article on arches. The preceding page was about the Catenary Arch. So how did the Romans get by with their non-catenary arches? The arches that the Romans built work because they are carrying a load. Usually that load is flat across on its top surface. Imagine an aqueduct. The top is flat, but slightly sloped, so the water will flow. Below you have series of roman arches so that this weight can be transferred to pillars. At the top of the arch there is less distance to the water channel than there is at the edge of the arch. That means that there is less weight for the top of the arch to carry. Not less water weight, but less weight from the masonry itself. The top of the arch carries less weight than the rest of the arch. The brick next to the top carries a little more, the brick next to that carries even more, and so on. This distorts the flow of forces, such that if you were to use a catenary arch there would be places where the arch is in tension. What happens if you want to carry a load that is not flat across? How do you determine the ultimate arch shape? The Spanish architect Gaudi used a trick. He would model the proposed design upside down. He used a chain to represent the arch. He then applied tension forces on that chain by suspending a bunch of chains from each link of the arch chain. These suspended chains were attached on one end and the other hung free. The length of the chain represented the load the arch was to carry. A long chain was a heavy weight. A short chain was a light weight. To represent a flat load you vary the length of the chains such that the ends would all be even. The chain at the apex of the arch would be the shortest chain, but their ends would all hang down the same distance from the ground. If you do this, and it takes a little trial and error, you end up with a shape close to a Roman arch. The arch chain naturally forms the type of arch needed to keep things in tension (and when inverted, in compression). I have shown how this works in the picture at the right. This shows that a Roman arch is nearly ideal for carrying a uniformly distributed load. If you want to mimic some other type of load distribution you simply adjust the chains accordingly. 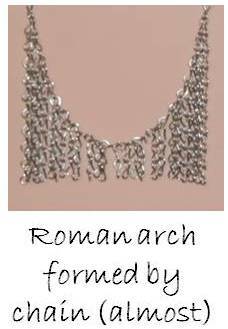 The difference between this chain arch and the Roman is that the Roman's arch is a half circle and then goes straight down. The chain-formed arch never quite comes straight down, but the top of the chain arch is very close to the Roman arch. 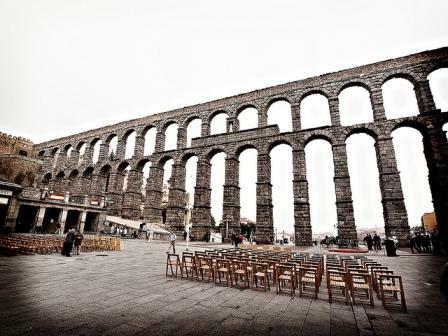 Without knowing it the Romans were using the nearly ideal shape for making things like aqueducts, or supporting large evenly supported loads, like Greek temple-style roofs. 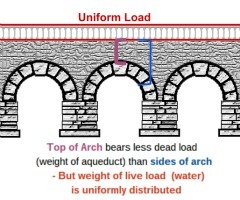 However, for it to work properly you need to have the spandrel area between the arch and the load filled in, so that the load gets distributed over the entire surface of the arch. This makes for fairly heavy walls and a big area where light cannot get through. To bring lots of light into the interior would take a new technological breakthrough. 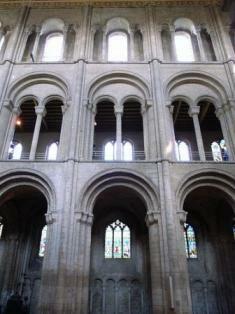 We see how this was done when we look at the Gothic Arch.